Workplace sensors are now ubiquitous. From tools to measure workplace occupancy and lighting levels to monitor temperature, noise, air quality and even collaboration patterns, social interaction and emotion, the office – and its occupants – are constantly under scrutiny. Deloitte estimates that sensors in property will grow at a 78 per cent annual growth rate between 2015 and 2020, with a total of 1.3 billion sensors deployed by 2020. George Orwell’s dystopian future has very much arrived. But, in many ways, sensors are nothing new. ‘The humble thermostat is a sensor,’ says Dr Kerstin Sailer, a reader in social and spatial networks at University College London. ‘Access cards that allow you through an office turnstile are sensors. These tools have been used for decades.’ What has changed is the technology itself and how we apply it, she says, moving from analysing data over a set period for a particular study to doing so on a long-term real-time basis. Another change, it could be argued, is how people view the technology. Whereas in Orwell’s book 1984 omnipresent government surveillance was used to persecute individualism and independent thinking, today’s workplace sensors are used in completely the opposite way – to allow people to choose their best working environment and have their best working day. It’s something that is increasingly important as more organisations move towards activity-based working. Using tools such as occupancy sensors in a workplace allows individuals to see where there are spaces free to work, which reduces their frustration in finding an empty desk, a common complaint in non-allocated desk environments, says Raj Krishnamurthy, founder and CEO of workplace sensor expert Workplace Fabric. ‘Organisations can also evaluate how and when their people interact with different spaces, and use these insights to inform the layout of their offices and the types of space to provide,’ he says. For example, occupancy sensor data can demonstrate whether there are spaces (desks, booths, or meeting rooms) that are less well-used than others at different times, enabling the organisation to analyse the reason why (typically poor temperature, light, noise, or air quality or a time-specific issue, such as the sun hitting a particular area at a certain time making it too hot or bright to work) and remediate appropriately. This allows workplace designers and managers to better understand the difference between planned use – how the designers anticipated people would use the space – and actual use – how people use it. It was the drive for this insight that led publisher Sage to introduce workplace sensors in the 1, 208 sq m editorial department at its office in London’s Oliver Yard. 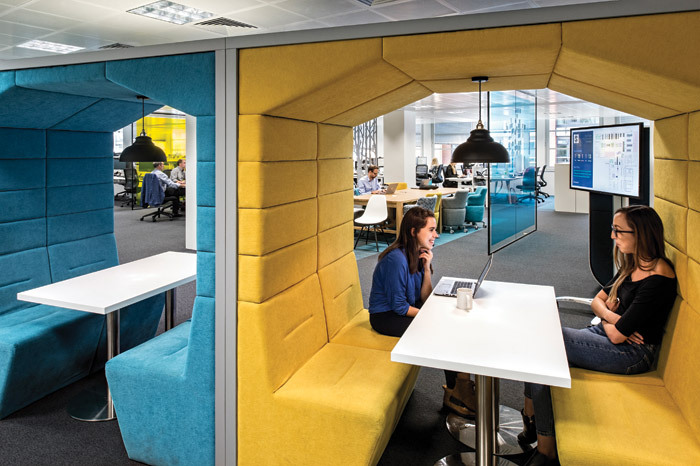 The move followed the introduction of unallocated seating for the editorial team that includes open-plan working spaces, library spaces for quiet work, jump spaces, Skype pods, creative collaboration spaces, meeting rooms and a cafe. Workplace Fabric installed its Freespace sensors in 250 individual spaces to measure how the new areas were being used. It found that some areas (in particular the meeting pods and jump spaces) were at times reaching 100 per cent occupancy. This knowledge has helped Sage to understand the exact nature of how space is used on the floor, and will be used on the roll-out of other floors. Being able to see, in real time, which spaces are available, with landmarks to orient users is incredibly useful and is improving people’s experience of the space,’ says David Barnard, global IT manager at Sage Publishing. In some offices, as the cost of sensors continue to fall, this is being taken even further with cutting-edge technology measuring not only occupancy, but also temperature, light, noise and CO2 levels. This is particularly useful for organisations wanting to adhere to the WELL Building Standard, which focuses on indoor health and wellness. These tools allow different parts of the building or different departments to adopt specific comfort settings. The building management system automatically adjusts temperature, light or air quality if it goes outside the prescribed settings. This has been successfully introduced at Red Bull Racing in Milton Keynes, for example, which worked in partnership with facilities management service provider Mitie to introduce the technology. Some organisations are even pumping oxygen into workplaces to counteract the post-lunch slump. It is the joined-up nature of these sensors that provides the real power, argues Gregory Blondeau, founder and director of Proxyclick, a visitor management app that integrates with a variety of other business systems from security and access control to room booking and catering, to ensure a smooth experience for visitors to corporate offices – and protect those buildings from unauthorised access. Workplace technology can no longer sit in isolation. Instead, to get the best data – and workplace experience for the visitor or occupier – these systems need to talk to one another, he says. ‘Everyone has had the experience of being a visitor escorted through a building, which can be awkward if you need to take a call, or pop to the bathroom. But if all the building technology can work together, you can be welcomed and make your own way safely and securely to the right meeting room where a coffee, made just the way you like it, is there waiting for you, together with the people you’re due to meet.’ Technology, it seems is less 1984 and more of an enabler to a great day at work. But there are still controversial areas. Dr Sailer believes there are three types of sensors: occupancy, environmental, and social. And it’s this latter area where organisations need to tread carefully. Social sensors measure interaction and collaboration patterns. There are also sensors that record speech to capture tone of voice and equality of conversation. Organisations like Humanyze use algorithms and voice sensors to analyse company email and office conversations to understand communication patterns and how work gets done in those environments. These insights are then used to support workspace planning, diversity and inclusion, workload assessment, collaboration and delivery and teamwork and engagement. But while this data is almost always anonymised, organisations need to be careful how they communicate this to staff so that people are aware that they may be monitored at work, even in an anonymised way, says Richard Francis, founder of The Monomoy Company, a strategic research and advisory firm for the built environment. And ethical considerations are not the only challenge when it comes to adopting a smarter environment, he says. The challenge is that for this to work, smart buildings have to improve their technology specification including WiFi and cabling and a more advanced building management system. Some of the systems might not speak to one another and will need intermediary software. ‘Who pays for this, the landlord or the tenant?’ asks Francis. Even when sensors are plug and play, some organisations don’t like open networks and see it as a security risk. ‘Although the reality is that occupancy sensors like Freespace are completely secure as they use encryption and only transmit anonymous and locally-processed intelligence,’ says Krishnamurthy. The key to occupier engagement, argues Monomoy’s Francis is to give people something in return. ‘People are more comfortable with giving over an element of privacy and their data if there’s something in it for them. For example, they might be happy to be tracked in a building if this allowed them to then know where colleagues are and connect with them. There has to be a personal benefit. Office workers are already using these types of tools to measure their own wellbeing both in, and outside of, the workplace. According to the Willis Towers Watson 2017 Global Benefits Attitudes Survey, three in five office workers use technology to manage their health. Just over four in 10 use wearables to monitor fitness activity or sleep while 30 per cent use technology to monitor eating habits. And that’s without considering the use of tools like Alexa and OK Google in the home, which more than half of American households will own by 2020. Research from CoWorkr and Haworth APAC on the future opportunities for data collection and sensor use in the workplace concludes that over the next few years we will move beyond the right-sizing of office space and increased utilisation, and enabling internal co-working and collaboration. These tools will be used to give office workers more flexibility about where they work – for example work at different sites depending on the vacancy levels or whether particular team members are based there. Once in that office, those workers will receive recommendation specific desks and location to use. Knowing the location of occupants in high-rise buildings could also be used by the emergency services during a fire, for example, to direct rescue efforts or confirm that everyone is cleared from a floor and firefighters do not need to enter, says Paul Sheedy, founder of Unifi.id, a tool which identifies who is where on a floorby- floor basis in a building, and enables automated communications with those individuals if needed. ‘These tools can be used in an emergency to save lives, not just the occupants but the firefighters too but it can also capture and improve on overall usage of each floor, lowering utility usage for example, but with optional enhancements for personalised treatment and automated notifications where appropriate,’ he says. The big question over the next five years is whether we will see more heavily automated buildings that have embedded sensors and technology. Or more ‘natural’ buildings that are designed really well. For Monomoy’s Francis it could go either way: ‘It’s going to be a third way – something in the middle that is a natural environment monitored by the tech to keep it at optimum levels and provide good user interaction.’ All of which means that the design community needs to start engaging more closely with these technology providers. ‘The design community needs to accept the input of data-driven guidance to influence their artistic flair,’ concludes Morgan Lovell’s Allen.